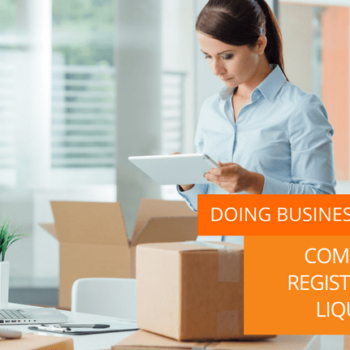 Awara Accounting offers investment support, company registrations, accounting, audit and business administration services in Moscow, St. Petersburg and across Russia. For more information about Awara Accounting and legal services, please, refer to our web-site www.awaragroup.com. No, the Russian economy is not in tatters as the former US President Obama prematurely announced in January 2015 only 10 months after the initial launch of the sanctions (March, 2014), which he thought would deliver a mortal blow to the Russian economy and thus secure US global hegemony. 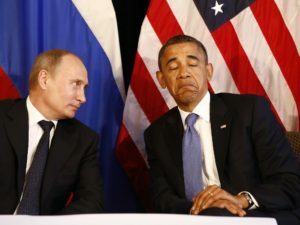 Obama counted on this being his chance to finally prevail over what he saw has his nemesis, the Russian President Putin, who Obama felt had been stealing his thunder all through his hapless presidency. Alas, all did not go quite as planned. The Russian economy proved resilient beyond belief. Far from tatters, Russia’s economy is now clad in a new shining armor impenetrable to any further attempts to destroy it. But those who still rely on news on Russia from the Western business press of the kind of The Economist, Financial Times and their ilk might not know anything about this. At best they would have heard, like the Financial Times wrote, that Russia did emerge from a recession “but growth remains anemic”, or as another source put it “growth remained sluggish at best.” Talking about anemic growth is the understatement of the year. It’s not anemic growth when Russia has fended off the biggest assault at its sovereignty since the end of WWII. Yes, we must admit that the sanctions imposed on Russia by the Western powers in effect represent economic warfare. They aimed at nothing less than destroying the Russian economy with a hope of engineering mass unemployment and social chaos which would eventually lead to regime change and a new government that would succumb to Western hegemony. IMF, the Queen of Western financial institutions, boldly promised that Russia would be clobbered with a 9 % cut off its GDP. There is no doubt that this IMF prediction reflected a modest assessment of what the perpetrators had been hoping to achieve. The events in the Ukraine were merely a sought for pretext for launching the economic assault. Everything had been built up for this with increasing ferocity for at least a decade. In fact, the aforementioned fake news business media’s reporting on Russia has served this same purpose by denigrating Russia’s role in the world and the achievements of its president and people. All this as a part of a massive decade long propaganda campaign (“Russia does not produce anything” and bla bla bla). We want to stress that there are sanctions of two types, officially enacted sanctions and unofficial sanctions. The latter have not been officially announced by any Western government but are deliberately pursued under the agenda of economic containment, itself part of the grand geopolitical strategy of Russia containment. By these measures Russian investors and exporters are actively by way of unannounced (i.e. illegal) rules hindered from entering Western markets and other global markets were those powers hold sway, and conversely Western (and other) investors are being discouraged (coerced) from certain investments into Russia. The economic containment takes many other forms, too, for example, it affects Russia’s participation in global financial operations and the rubles role among global currencies. We assess that the unofficial sanctions are even more cumbersome and harmful than the official ones. Considering this backdrop, the major strategic goals of Russia’s geopolitical competitors and the intended effects, this is not the time to speak about anemic nonsense. We think the occasion is rather more suitable for declaring victory. Apart for some belt-tightening on the part of the consumers nothing was achieved, there was no major dent in Russia’s economic armor. Not only was nothing achieved, but rather Russia proved right Nietzsche’s maxim: That which does not kill us makes us stronger. Yes, Russia has emerged stronger than ever after these three years of economic defense. It has now achieved the unprecedented role of a quadruple superpower: industrial superpower, agricultural superpower, military superpower and geopolitical superpower. Russia now has the world’s most self-sufficient and diversified economy capable of producing anything possibly made in the world. Russia is now for the first time in its history food self-sufficient while simultaneously exporting more food than ever. This report follows up on Awara’s seminal report of December 2014, showing the actual modernization of the Russian economy in the Putin era from 2000 to 2014. The report titled Study on Russian Economy. 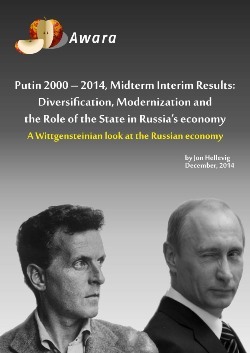 Diversification, Modernization and the Role of the State in Russia’s Economy can be downloaded here. At the time of its publication, the report shocked the Russia expert community with its revolutionary insight disproving the standard widely distributed myth about the Russian economy, which all could be grouped under the headings “Russia does not produce anything,” “Russia relies exclusively on its hydrocarbon revenue,” and “Russia has failed to modernize and diversify its economy.” We proved that each of these contentions were false and predicted – against the consensus – that Russia would be strong enough to withstand the sanctions assault and would cope with the lower oil price. Events have proven us right. The facts are presented in this report. A lot has changed in the world since this report written, most importantly, our prediction that Russia’s economy would be strong enough to rebuff the enemies was proven correct. The ultimate consequence of the gross miscalculation of the West regarding the perceived vulnerability of the Russian economy was that it cost them their world hegemony as an even stronger and more independent Russia emerged after the initial attack to successfully reclaim its status as a world superpower. Our report shows that during the three years following the onset of the sanctions, the Russian consumers lost approximately 10% of their purchasing power. (And hereby, there is reason to think that this represents to a great extent a self-inflicted damage caused by the Central Bank’s overzealous monetary policies aimed at countering inflation – literally – at any cost. We will return to a more detail overview of the CB’s policies later on). Apart from consumption and personal income related indicators all other major economic indicators show only slight decreases on a balance for the sanctions years of 2014 – 2016. The results so far from 2017 already point to a veritable turnaround and real growth across the board, including 2 to 3% GDP growth and growth of industrial production of 3 to 4%. We give the details on all the main categories of the economic indicators further below (See section: Corroboration to our findings – Economic indicators). Here is a short over view of some of the main indicators. GDP was down 2.3% in 2014-2016, expected to more than make up for that in 2017 with 2-3% predicted growth. Industrial Production was down merely 0.6%. A handsome recovery is already on its way with an expected growth of 3 to 4% in 2017. In May the industrial production already soared by a promising 5.3%. Unemployment remained stable all through 2014 – 2016, the hoped for effect of sanctions causing mass unemployment and social chaos failed to materialize. 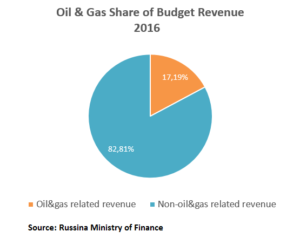 The really devastating news for “our Western partners” (as Putin likes to refer to them) must be – which we are the first to report – the extraordinary decrease in the share of oil & gas revenue in Russia’s GDP. 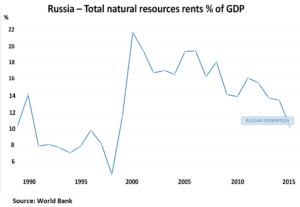 Chart #3 shows that as of 2015 according to World Bank data the total natural resources rent (the national income derived from natural resources) was 10.3%. It should be noted that the figure includes also income from other natural resources than the energy sector. We are not privy to the break-up of the figure on its components, but we think it is fair to expect that other than hydrocarbons would comprise a couple of percentage units, thus leaving oil & gas with only an 8% share of the GDP. (Disclaimer! We do not assume any liability for the pain this piece of news may cause to Russia haters who have been relying on fake news outlets for their information. In severe cases, those readers should seek immediate professional help). This is a perfect piece for demonstrating how unbothered with facts the fake news media is when they make up their Russia bashing stories. CNBC interviewed an expert called Thin – well if you need to make up your analysis out of thin air, then that’s a good start for sure. (He is presented as Win Thin, global head of emerging market currency strategy with Brown Brothers Harriman. Sic!). This so-called “reform plan” is essentially a hookah dream that the guys running around all day in oversized white pajamas and fancy dressing gowns and having migrant labor taking care of all the real work, would turn the Saudi desert kingdom into an industrial high-tech powerhouse. The idea is that instead of working hard to develop its own industrial and technological base Saudi Arabia could simply buy itself one wholesale for X amount of billions of dollars. Well, why don’t you hear about such grandiose “reform plans” from Russia? It’s quite simple, there is no reason whatsoever for Russia to attempt to turn its economy upside down with imaginary reforms. 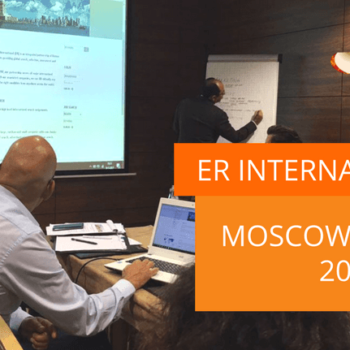 As this report shows, Russia already runs a modern and diversified economy. There is no need for any kind of dramatic reforms. In the grand scheme of things, Russia merely needs to adjust its strategies (as all countries would continuously need to do), especially what comes to its monetary policies so as to be able to provide financing to its industries on globally competitive market rates, and do more of what it has already done best: emphasize the role of state corporations and develop state owned national champions, which could be able to conquer global markets. Oil & gas related revenue made up only 17% of the total consolidated budget revenue in 2016. 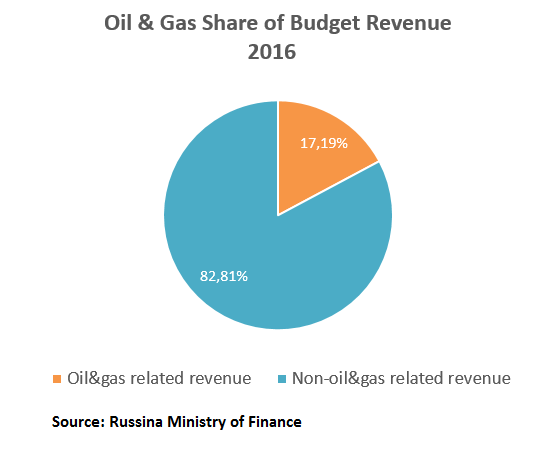 The charade that Russia has supposedly failed to modernize and diversify its economy has been concocted around three arguments: First, that oil & gas makes up a disproportionally big share of the GDP. Above we have punctured this absurd and obviously wrong pretense. Second, that oil & gas revenue accounts for half of the budget revenue. This claim we also proved baseless. Third, that Russia’s exports are overwhelmingly dominated by oil & gas. This is, however, true when taken merely at face value. Yes, true at face value, but false in what comes to the conclusions. Surely people who pretend to be experts in economy, would have to dig deeper than the face value. 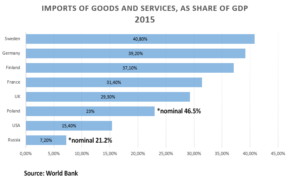 The thing is that while it is true that Russia’s exports remain relatively undiversified, it is also true – as can be seen from above chart – that Russia’s import volumes are the lowest in the world in terms of their share of the GDP. The chart shows that Russia’s imports as a share of GDP was as low as 7.2%, while the corresponding level for Western European countries was between 30 to 40%. What this then means is that – as Russia imports so preciously little – it produces domestically most of what is consumed and invested in the country. It has been a failure of epic proportions of the “experts” to claim that Russia’s economy is not diversified just because the exports (which is a relatively small component of the economy) were not diversified. If they were not so lazy-minded they would look at the other side of the equation, and see that Russia has the lowest level of imports (as a share of the GDP) of all major countries. This is really as ridiculous as if a doctor would make a health check on a patient and merely look at his left hand and based on that draws the conclusions on the person’s health. Or, focusing on the hand, we could say that this kind of argumentation is on the level of palm reading. As a matter of facts, there are some very real and concrete constraints, which have prevented, and will continue to prevent Russia from increasing its exports of manufactured goods as long as these real constraints are not identified. The reasons are both of historical nature and related to the present realities of global trade, the already high level of saturation and entrenched positions of globally dominating, mostly Western based, transnational corporations, and the whole world trade order based on institutionalized hegemony of the Western countries, as well as, their seemingly unlimited access to virtually interest-free financing. Russia can begin to tackle these problems only through similar geopolitical maneuvers (fortunately, initial progress has been made in this regards) and a very well thought out strategic marketing plan on the level of both the national economy and corporations. When this all started in 2014, the Western press was soon awash with stories that Russia – of all countries – would break under the strain of its supposed “enormous debt” and run out of its reserves in two years. We have analyzed the flawed arguments in this respect of two of the supposed experts, Paul Krugman and Anders Aslund. We put these gentlemen on notice already back in December 2014, in a couple of articles in the Russia Insider, for spreading the obviously false claims that Russia would have a debt problem. For details, please, refer to the discussion in section Debt and Reserves under the subheading Krugman and Aslund were proven wrong. The qualitative strength of Russia’s economy – against the backdrop of the alleged “anemic growth” – is perhaps best discerned from the statistics on demographics. In the Putin era, Russia has performed a remarkable recovery in population growth and public health. Surprisingly, this trend was not set back but even strengthened during the years of economic defense on against the Western sanctions assault. In the years following the sanctions, all the main demographic indicators have continued a positive trend, several of them now standing at an all-time high. 1) Population has grown to 146.8 million refuting the doomsday predictions popular just a few years ago of a dramatic population decline. This is also a historic record high for Russia (within present borders). 2) Natural population growth has stabilized with growth of number of births and decline of deaths, the figures now being on par. 3) Number of homicides and suicides have continued to fall with amazing speed. 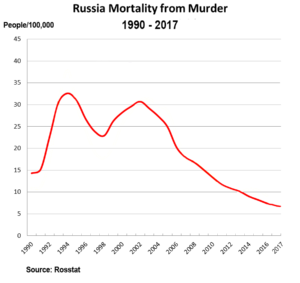 Homicide rates are down by a staggering 80% since Putin first became president in 2000. Even during the years of economic defense since 2013, the downwards trend continued with a more than 20% drop. 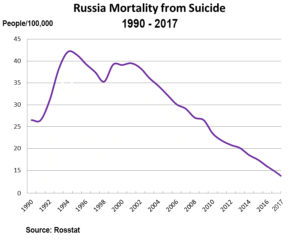 Manifest improvements in social security and the optimism that has taken root in the Putin era have seen suicides going down by 60% since 2000 also with a 20% decrease since 2013. 4) Infant mortality has decreased from 17 deaths per 1000 births in 2000 to 5.2/1000 (Q1 2017). In an international comparison that would now rank Russia on par with Canada, 34th among all world’s nations. Further details on all major indicators are presented further down in this report. From point of view of the geopolitical goals and economic weapons employed, the sanctions proved on epic failure. Russia reemerged from the crisis with minor scuffs and scratches but otherwise largely intact and has now been relaunched on a new development tract as a quadruple superpower: industrial superpower, agricultural superpower, military superpower and geopolitical superpower. Why then did the sanctions fail? The most fundamental reason is that the perpetrators did not have a clue of the actual conditions of the Russian economy. The leaders of the Western powers and their intelligence agencies were themselves affected by their own propaganda and falsely believed that Russia’s economy in fact was as weak as it was portrayed by The Economist and its ilk. After a decade of Russia bashing economic analysis and fabricated intelligence reports, they had taken on a life of their own. Any source material employed for producing an analytical report would inevitably be based on the same biases and falsehoods, and finally nothing said about Russia was real anymore. 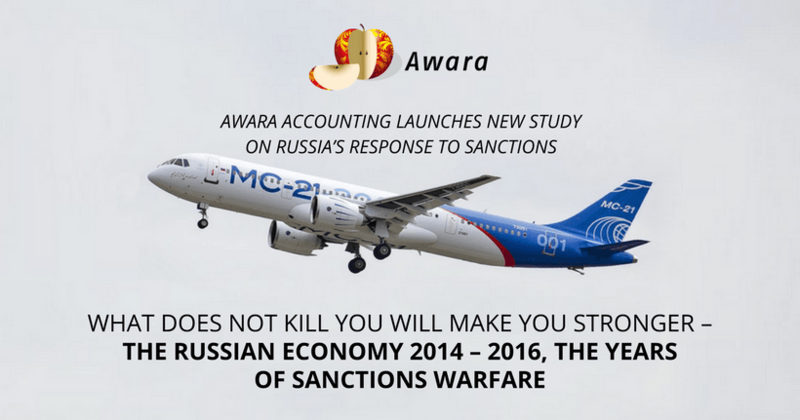 That is why our Awara Accounting report on the achievements of Russia’s economy 2000 – 2014 caused such a furor at its publication as it revealed the true health of the Russian economy. By the time of the sanctions onslaught, Russia had sufficiently modernized and diversified its economy and the country’s financing and fiscal position was strong. Contrary to the claims of the propaganda machine, Russia did not have a debt problem, and could not possibly fall into one. A particularly ridiculous claim had been floated in the years prior to the sanctions by Russian liberal economists – immediately picked up by the Western pundits – that Russia needed an oil price of $100 (some versions $110) in order to balance the budget. This contention completely missed some basic economic facts, namely that the oil export revenue is in dollars and the Russian budget in rubles, and if there is a decrease in the price of oil then the Russian ruble was bound to devaluate. Exactly what happened, as a result of which the budget was balanced at the new much lower level of oil price. Further the idea was contaminated by the false propaganda claims that Russia’s economy was overly dependent on oil & gas. Based on the constant parroting of the line that energy exports made up two thirds of all, they seemed to believe (which association was the one intended by the propaganda center) the meme of the overwhelming share of hydrocarbons in GDP and ditto of tax revenues, while in fact back then by the latest available data their share of the GDP was 16% (now below 10%) and of tax revenue 27% (now 17%). There was no clear understanding of how low the levels of imports were in relation to the national economy. Clearly even the Russian Central Bank was laboring under the assumption that the share of imports in the consumer basket was vastly greater than it in fact was. (Which wrong assumption led to its overzealous monetary policy aimed at suppressing actually non-existent causes of import related inflation). More fundamentally than that, there was no understanding that Russia in fact already then was a market economy more so than the West of today. On the strength of being a market economy, its government, its currency, its corporations, its workforce and its consumers were rapidly able to adjust to the new economic realities. Just compare with the realities of Western economies. They thrive on the back of monopoly currencies which allow them to rig the financial markets and pump in (for now) unlimited amount of fiat money to keep the system running. Their markets, including the job markets, are rigid and regulated in every aspect, and do not allow for any flexibility. The debt mountains created by that rigged system rules out devaluation and interest hikes, which would be needed for cyclical adjustments in any economy. In this connection, we also want to take the opportunity to refute the widely distributed claim – habitually taken on face value – that it was the Reagan initiated arms race that knocked the USSR. We do not believe this was the cause, rather the undoing of the USSR was the attendant lack of a competitive market economy. In a market economy, an arms race (within reasonable limits) can actually be beneficial for the economy, as in fact was the case in the United States at that time. Interestingly, we may note that by 2014 – just in time – what Russia had in fact achieved was the overhaul of the economy contemplated by the Soviet leadership in the early 1980s. It is our understanding that the intelligence agencies, who possessed call to reform the Soviet Union had first been initiated by the top military brass and the leaders of the real information of how things stood in the world. They saw how the Soviet economy was falling fatally behind the West and especially so in technological development. This was deemed to be the greatest national security risk and had to be cured. This is why these structures initiated the renewal policies called the Perestroika. They knew what had to be done, but unfortunately – contrary to the Chinese – they did not know how it would have to be done. This led to the fatal appointment of Mikhail Gorbachev as the country’s leader. 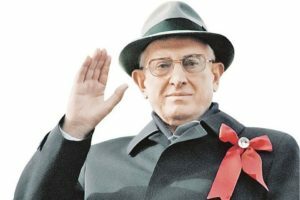 It is not as if the Perestroika was his brainchild, he was just appointed to implement it, however, the failure in the implementation and the ensuing chaos can fairly and squarely be attributed to Gorbachev’s hapless leadership. Basically what happened was that Gorbachev proceeded by removing the government while maintaining the system of Communist administrative economy. The Chinese did the exact opposite, they maintained the government of the Communist system, but introduced market economy. Gorbachev should have understood that you cannot maintain a centrally planned economy without a very strong central government to enforce it. Naturally only chaos, corruption and bandit capitalism could follow from the system he launched. (Notably, when Putin set out to reform Russia, he started with a relative restrengthening of government). Unfortunately, Gorbachev believed in the charade that Western values, democracy, free press and all those good things would in themselves translate into economic prosperity. Anyway, after a three decade long detour because of the failed policies, chaos, anarchy, banditry, and immeasurable suffering for the people, the goal envisioned by the Soviet leaders was by 2014 completed by Putin. Russia had successfully modernized and stood ready to withstand the renewed assault of the Western hordes. During the years of sanctions, Russia has readied the MC-21 mid-range jet airliner, here on maiden flight May 2017. Example of qualitative growth. Interpreting the performance of the Russian economy 2014 – 2016, what strikes is that there seems to have been a qualitative development against the backdrop of quantitative stagnation. We refer to the facts that the indicators concerning personal income and consumption was down (by a tenth), whereas the overall economy fared much better as measured, for example, by GDP (down by only 2.3%) and industrial production (stable at -0.6%). This means that fundamentally there has been qualitative growth at the cost of consumption, which latter in essence could be considered as waste. Development of the economy and GDP growth are not the same things, there can be development even without overall growth, as we have seen. We must ask, what is the point of so-called GDP growth in Western countries, which is entirely fueled by vastly excessive borrowing on below-market terms and geared almost exclusively on consumption waste. (Even talking about “growth” is misleading here. In fact, there is barely any growth in the Western countries, and in most of the countries the rigged financing and consumption waste is merely covering up for actual GDP declines). Presently, there has been a lot of discussion around the topic of how to formulate Russia’s future economic strategy. In a forthcoming installment to this report, we will discuss those initiatives more in detail. At this point suffice to say that we regard the ideas floated, especially those by the liberal economists and international organizations, as bland and senseless at best, and pernicious at worst. They have clearly not understood the present realities and the challenges and opportunities that lay ahead of Russia. Here’s a brief sketch of our understanding of these issues. The economists should lay to rest their eternal concern about the oil price. As we have shown in this report, oil & gas make up only less than 10% of the GDP. (Stop complaining and be grateful you have it). More than the price of oil, what matters is the price of money, that is, interest rates. Fortunately there is now realistic prospects of a significant decrease in the lending rates. Even when this comes through the misguided policies of the Central Bank, it is still bound to happen. The two units decline in interest rates during the last half a year has already given a considerable boost to the economy which is now on its way to a 2 – 3% growth. Roughly, we estimate that each percentage unit decrease in the CB’s key rate would in the short term translate into an additional 0.5 to 1% growth of the GDP. But it is not enough to trust markets to cure the problem, not in the global conditions of rigged Western financial markets and monopoly currencies, as well as the continuous hazards due to the West’s Russia containment strategy. Russia must develop mechanisms to offer on a broad base globally competitive financing to all corporations, be it through subsidized rates or even through Central Bank’s money emissions, comparative to the West’s quantitative easing programs. Russia has placed its industry at a massive disadvantage in the global competition when it does not do anything to match the monetary doping that the Western competitors enjoy. Russia must understand that the Russia containment strategy of the West will be there for years to come, and will only disappear the day when they gather the courage to understand that Russia has overcome. Therefore, Russia must root all its economic strategy and development efforts in a firm understanding of this reality, and never to count on West in anything. Russia must, focus on China, the East, and the rest of the world. All further privatization, based on the failed globalist liberal ideology must be rejected and instead Russia must strengthen state ownership in key branches of the economy, in order to build globally competitive national champions, and in order to prevent Western multinationals bankrolled by their money printing presses to gobble up Russia’s up and coming promising enterprises. In a future installment to this report, we will present Russia’s highly successful import substitution program. This is the kind of things Russia must continue to invest in, but not forgetting to heed our advice, that state ownership must be guaranteed in the new fledgling industries. Russia must also speed up investments in transport and other public infrastructure as well as investment in urban renewal and amelioration programs, in the way it has been done in Moscow. In many other sectors of the economy and the social sphere, there are adequate policies in place, many of which require years and years of patient work in order to bring the desired results. A prime example of this is the fight against corruption and the interrelated problem with the gray or shadow economy. There has been a marked improvement in this respect year by year since the early 2000s, but still a lot remains to be done. This problem presently still hides a huge untapped economic and fiscal potential. In response to the sanctions, Russia has reoriented its trade to the East, and now China it is by far biggest trading partner, and growing. Concluding this brief overview of the future challenges and opportunities, we’d like to express our opinion that in many key aspects of policy it seems that what is actually being done under the leadership of President Putin is much better – as this report has shown – than what you would gather from listening to the public policy statements of cabinet ministers and other key government officials. Putin seems to be reluctant to engage in an ideological or even theoretical debate on economic policy while most of the top officials are annoyingly generous with stating their preferences for liberal policies, which get all the attention in the main media. Thankfully, Putin’s actual economic preferences and actions seem to be at variance with that discourse. Although, unfortunately the Central Bank seems to enjoy Putin’s full backing in its detrimental austerity policy. Through all the three years of sanctions and depressed oil price, the Russian GDP was down only a combined -2.3%. In May 2017 GDP jumped to +3.1% year-on-year. For January-May 2017, GDP stood at +1.3%. This motivates an estimate of +2 to 3% growth for the full year. Thus all the losses suffered following the onslaught of the economic war would be recovered this year. In this connection, it is also good to remind what is the absolute size of the Russian economy in terms of GDP. This is important as the fake news business media is trying to decimate Russia’s economy by recalculating it according to the fluctuations in the RUR/USD exchange rate, which gives the so-called “nominal GDP.” Using this method, the legend is spread that Russia’s economy is supposedly “about the size of Canada’s” (which in itself is an improvement to the version practiced only a few years ago according to which it was “the size of Holland”). A popular version of this myth is also that it would be “smaller than the economy of California.” However, the only correct method for evaluating the size of a country’s economy is by use of the PPP method (Purchasing Power Parity), which measures the comparative size of an economy in terms of real output of goods and services. According to this method, Russia’s GDP was $3.75 trillion in 2016, the world’s sixth biggest economy just slightly after Germany with its $3.98 trillion. 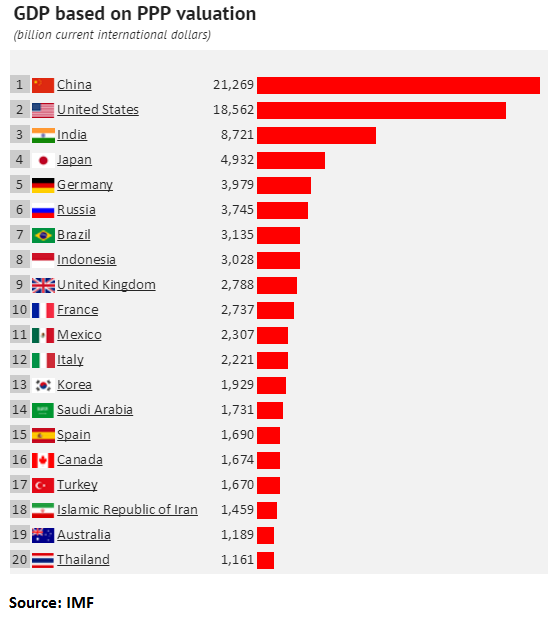 Chart #2 lists the world’s top 20 economies in 2016. We predict Russia to push through the 4 trillion level in 2017 and overtake Germany by 2018 to become the world’s fifth biggest economy. A good idea of what the PPP method means in practice is given in an earlier article we wrote for the Russia Insider titled Russia and China Will Win the New Arms Race. It shows why Russia’s military spending which is about 15 times less than that of the U.S. in fact buys Russia as much new weapons and security as the U.S. gets. Contrary to the persistent myth that Russia’s economy would be exclusively dependent on oil & gas, the share of hydrocarbons are in fact below 10%. 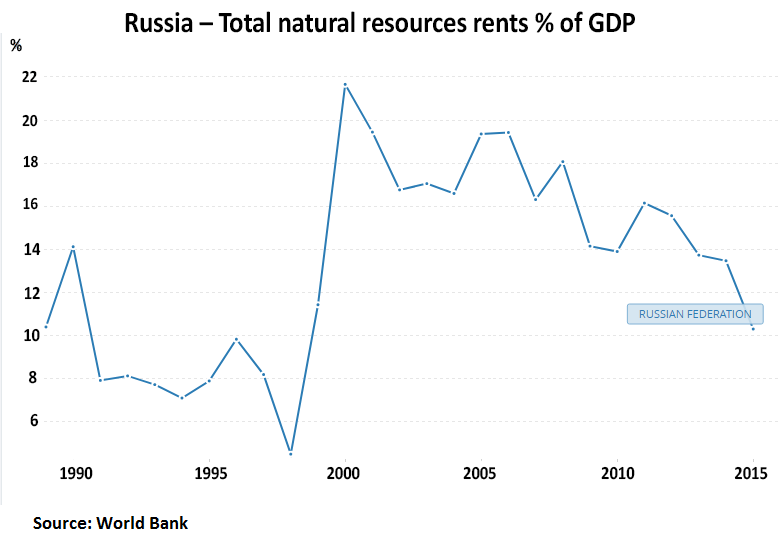 The chart shows so-called natural resources rents as share of GDP. The World Bank defines ‘natural resource rents’ as the total contribution of natural resources to a country’s economic output. This figure contains in addition to extracted oil & gas also other extracted minerals and forest rents. We are not privy to the break-up of the figure on its components, but we think it is fair to expect that other than hydrocarbons would comprise a couple of percentage units, thus leaving oil & gas with only an 8% share of the GDP. This share of oil & gas peaked at 22% around 2000, but as we can see from the chart, it never made up the overwhelming share of Russia’s GDP as it has been claimed. It should be noted that in the 1990s the share of oil & gas was very low, even considering that Russia’s economy was otherwise in tatters during that period. In 1998 it even dipped below 5%. The reason for this was by no means that the role of oil & gas was insignificant in Russia’s economy at the time, quite the contrary. What happened is that the oligarchs were just stealing it and through a myriad elaborate schemes avoiding taxation and customs duty. This all changed when Putin in 2000 came to power, jailed the oil tycoon Khodorkovsky, put an end to the schemes and raised taxes and duties. Thanks to these measures, the oil & gas wealth was put to work for the common national economy for the benefit of business and population. Industrial production remained stable all through 2014 – 2016. Industrial production soared in May 2017 year-on-year by 5.6% bringing the increase to 1.7% for January-May 2017. Hereby, the index already stands at +2% compared with 2014. The agriculture sector grew a combined 11.1% in 2014 to 2016. In the years of sanctions, Russia has grown to become an agricultural superpower with the world’s largest wheat exports. Already in the time of the Czars Russia was a big grain exporter, but that was often accompanied with domestic famine. Stalin financed Russia’s industrialization to a large extent by grain exports, but hereby also creating domestic shortages and famine. It is then the first time in Russia’s history when it is under Putin a major grain exporter while ensuring domestic abundance. Russia has made an overall remarkable turnaround in food production and is now virtually self-sufficient. In looking at food production, it is often forgotten that it consist of two components, agriculture (farming and breeding) and food processing. Russia’s food processing industry has also greatly developed and grown in recent years, reaching a cumulated growth of 6.8% in the three years of sanctions. It is also noteworthy that the Russian workforce has remained stable and actually grown by a few millions since 2000, even though the number of people reaching working age has dropped sharply since 2005 following the demographic crisis caused by the Perestroika and the chaos of liberal policies in 1990s. It is the worker and consumer that have had to bear the brunt of the economic hardships caused by the sanctions and drop in oil price. Both disposable income and salaries are significantly down. The same belt-tightening of consumers can be seen from the figures for retail sales which were down by -12.7% It is our belief that the situation in this regard has been exacerbated by the unjustifiable austerity program of the Central Bank. The disposable income per capita averaged at 30,738 rubles in 2016. In 2016, the monthly average salary per capita in Russia was 36,703 rubles, that equaled 546 USD (average rate for the year). At a first glance this is a very small amount compared with most of the Western countries. But for the comparison to be sensible, one would have to adjust the salary to the purchasing power (PPP, purchasing power parity). According to the IMF the PPP adjustment coefficient between Russia and the United States was 2.95, meaning that the prices on average for all goods and services was about 3 times cheaper in Russia than in the U.S. With this in mind, you would have to multiply the Russian average salary by 2.95 for it to be comparable with a U.S. salary. The comparative salary would then be 1,600 USD. But there is yet a further adjustment which should be made to compare the Russian salary with a foreign one. It must be adjusted for personal income tax. Russia applies a flat tax of 13% on all salaries, this is very low in comparison with most Western countries. We will demonstrate the difference with a comparison in relation to the EU country Finland. In Finland, the taxes levied from salary are punitively higher the more a person earns. For a monthly salary of 3,000 euro the taxes are 30% (slightly different rates in various municipalities). Thus of a salary of 3,000 euro, a person would be left with 2,100. In USD this would spell a net salary of 2,300 out of a 3,300 gross salary. We remind that the PPP adjusted salary in Russia was 1,600 for a gross salary of 546. When we consider the tax (546 -13%) the net salary would be 475, which would give a PPP and tax adjusted salary of 1,400. As a result of these adjustments, we then see that a Russian salary of USD 546 would give an effective net salary of 1,400 compared with 2,300 for Finland for a 6 times higher gross salary of 3,300. Correspondingly, a 900 USD salary in Russia would equal a 3,300 USD salary in Finland. The higher the figures we compare, the more truly shocking are the results. Thus, considering the punitively high taxes for higher earnings, a person earning 10 thousand USD per month in Finland would have comparatively same net earnings as a person earning 1,800 in Russia (PPP and tax adjusted). For more information on comparative income and other payroll taxes, please, refer to Awara’s Global Survey on Total Payroll Taxes. In a bewildering policy motivated by inflation targeting, the Russian Central Bank has inflicted record high real interest on the economy ever since end of 2015. Presently the primary real interest rate stands at a stunning 5%. This is an unprecedented situation in a global comparison. On the contrary, the US Federal Reserve and the European Central Bank have fought against recession by bringing the real interest rates to historical lows, even to negative territory. Without this excessive austerity the Russian economy would have fared yet much betters, especially so the consumer. Hereby, one should bear in mind that the difference between the Central Bank’s key rate and the consumer inflation rate only reflects the primary indicator of real interest rates. But businesses and consumers do not borrow at the CB’s key rate, their borrowing rates are yet vastly higher (15-20%). 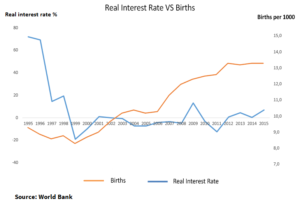 The charts 14 and 15 (below) point to a disturbing correlation between high real interest rates and births. Chart 14 is taken from World Bank and Chart 15 is produced by Awara with the latest data on inflation and the Central Bank’s key rates. 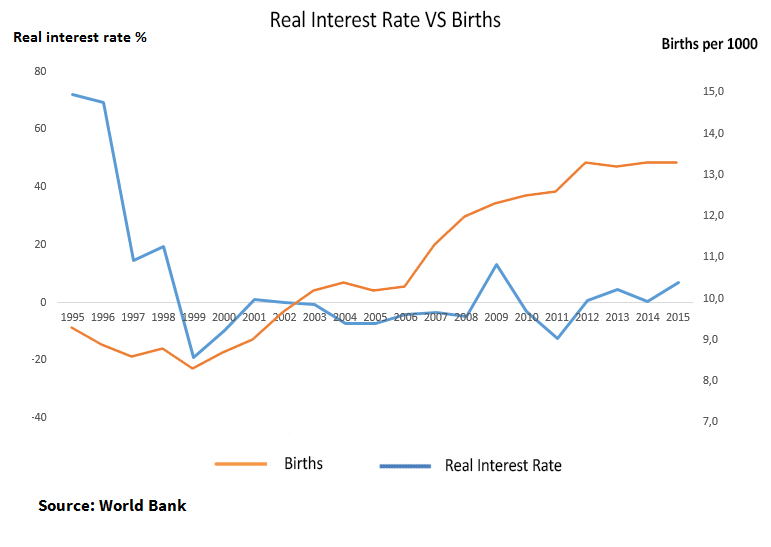 The World Bank chart contains the actual real interest rates as a difference between inflation and real borrowing rates. However, the World Bank series goes only to year 2015. We have therefore produced the other chart to show the primary real interest rate (CB rates minus inflation) to illustrate the situation for the recent years (bearing in mind that the actual real interest are even greater than this). 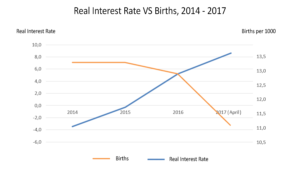 Both charts show that the birth rates have fallen with high real interest rates. The Central Bank therefore must take urgent measures to reduce the gap before the situation worsens further. All through the years of the imbroglio, the trade balance remained hefty notwithstanding the substantial decrease in the (monetary) value of exports as they were compensated by a corresponding drop in imports. The trade balance grew again in January – April 2017, with a 30% increase in exports and 20% in imports. To counter the inimical actions of the West, Russia has actively reoriented its economy towards the East and the rest of the world. As a result, imports from APEC countries (Asia-Pacific Economic Cooperation) make up 40% of all Russia’s imports (April 2017), up from 34% in 2013. In the same period, imports from the EU have dropped from 42% to 38%. We expect this downward trend to continue as Russia’s import substitution programs mature and the new trade relations and economic cooperation initiatives with the East fully materialize. Already now, imports from China alone make up 20% of the total, up from 17% ante bellum. This comes against a reversal in Germany’s fortunes, which used to be the preeminent source of Russia’s imports. Now Germany’s exports to Russia are down to 10%, only half that of China’s. In an international comparison, Russia’s exports of manufactured goods is relatively low whereas it is dominated by exports of oil and gas. Strangely enough this has led all economic analysts and policymakers to declare in unison that Russia’s economy is underdeveloped, that it has failed to modernize and diversify. We have not been able to identify a single (supposed) expert, who would not have bought into this myth. Yet, what happens is that these people, on both sides of the divide – under the influence of tendentious reporting aimed at denigrating the global role of Russia – have been staring blankly at only one side of the equation, namely exports, and totally failed to see the relevance of imports. The point is that Russia has the lowest level of imports (as a share of the GDP) of all major countries.. Russia’s very low levels of imports in the global comparison obviously signifies that Russia produces domestically a much higher share of all that it consumes (and invests), this in turn means that the economy is superbly diversified contrary to the claims of the failed experts and policymakers. In fact, it is the most self-sufficient and diversified economy in the world. 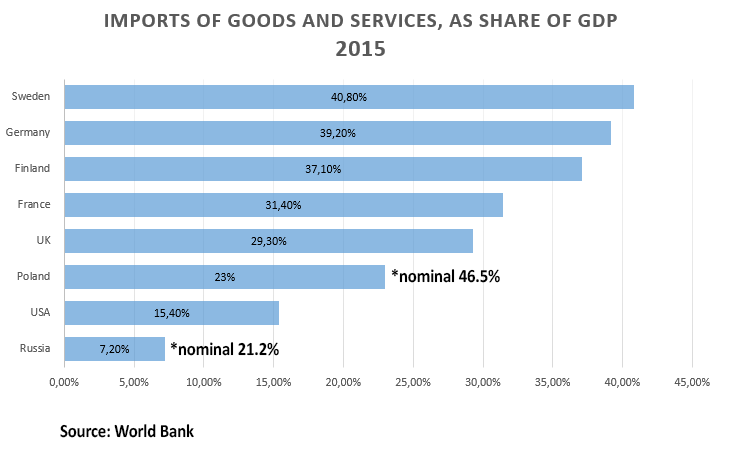 Our argument that Russia’s economy is the most diversified in the world is easily proven by World Bank statistics on the share of imports of goods and services as a percentage of the GDP. This is illustrated by Chart 17, which compares the levels of import of Russia with a sample of countries. It shows that Russia’s imports as a share of GDP was as low as 7.2%, while the corresponding level for Western European countries was between 30 to 40%. However, to arrive at these figures we have corrected a major flaw in the World Bank statistics. For some incomprehensible reason the World Bank uses the nominal GDP as the denominator, when the correct method would obviously require the PPP adjusted GDP. (PPP for purchasing power parity). The PPP adjusted GDP indicates the size of a national economy in terms of its volume, while the nominal GDP merely reflects its US dollar value at a given date. If we want to know what is the share of imports of the total economy, we therefore must compare the imports with the volume based PPP indicator. In keeping with the above, we have therefore adjusted the data vis-à-vis Russia with the PPP GDP figure for the relevant year. However, we have not gone through the exercise of doing the adjustment for all the presented countries. By definition the nominal and the PPP value of the U.S. economy is the same (as that is by convention the country against which all others are compared), therefore there obviously is no need to change anything for the U.S. For the other countries listed the nominal and PPP values were much closer with a 0 to 10 % mark-up and therefore the given numbers fairly accurately reflect the import share without any adjustments. This expecting Poland, which we also adjusted for PPP with a ratio of 2 to 1. Even with the flawed nominal GDP comparison, Russia’s imports stood at the globally low 21.1%. In Q1 2017, imports have considerably picked and may grow by a quarter in the whole year. This would, however, not alter the general picture evidencing that that Russia’s import volumes indeed are exceptionally low. The surplus of the current account has remained healthy, being $25 billion in 2016. In Q1 2017 the current account surplus again picked up to $22.8 billion, compared with $12.9 billion in the same time last year. This has come as a result of a significantly improved services balance, going from -$58 billion in 2013 to -$24 billion in 2016. The biggest improvement – a quantum leap – came thanks to Russia’s significantly improved domestic tourism facilities following the reunification of Crimea, investments in Sochi and other improved tourism and transport offerings. In 2013, Russian’s spent on travel abroad (import of travel) a staggering $53 billion while incoming travel (export of travel) amounted to $12 billion, leaving a disastrous travel deficit of -$41 billion. In 2016 the figures were significantly improved, foreigners spending $7.8 billion on travel in Russia (export), whereas Russians spent $24 billion on travel abroad (import). The travel deficit had thus been more than halved to $16 billion. Considering these enormous changes and the overall impact it has on Russia’s macroeconomic conditions, Russia’s government should remain focused on tourism and ensure that people prefer to travel domestically. Another big item in the Current Account is charges for intellectual property rights (royalties etc.). This line represented a deficit of $7.6 billion in 2013, and was down to -$4.5 billion in 2016. The deficit for “other business services” was $5.8 billion in 2016, up from $4.4 billion in 2013. 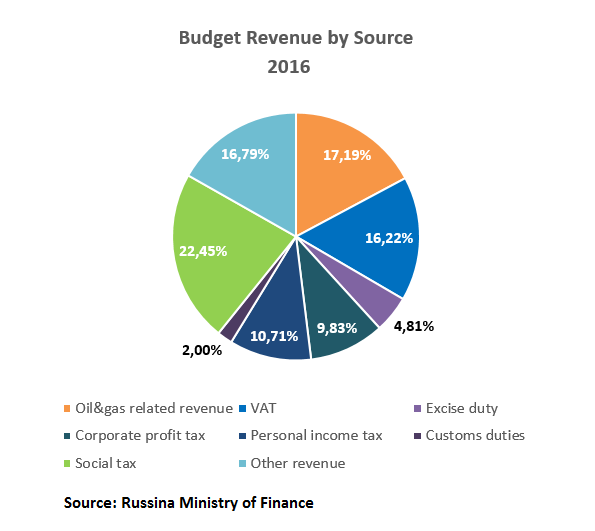 Due to considerable growth of revenue (20%), the deficit was eliminated and Russia’s budget was balanced per Q1 2017. 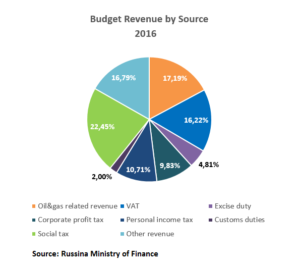 Russia has through the years of economic warfare managed to maintain a fairly balanced budget with levels of deficits that would be envious for most Western countries. Our data refers to the Consolidate Budget of the Russian Federation and not the Federal Budget that gets the priority in official discussion and media reports. The Federal budget represents only a part of the state revenue system. Part of the taxes goes to the regional budgets: all of personal income tax, all social tax (which are the two biggest revenue sources) and approximately 2/5 of corporate profit tax. The Federal budget collects the oil & gas related taxes and duties, 3/5 of corporate profit tax, VAT and excise taxes. The Consolidated budget represents the sum of all the regional budgets as well as the Federal budget. It is a matter of convention and fluctuating legislation, which taxes are recorded in which budgets, therefore giving preference to the Federal budget figures is totally wrongheaded. The Government frequently announces that the oil & gas related revenue makes up so and so big a portion of the Federal budget. But why should we care, the important thing (for whomever it is important) is what share it makes of the total state revenue as it is reflected by the Consolidated budget. Fortunately, since we criticized this strange practice in our report of 2014, the situation has at least started to change, and the Ministry of Finance now also reports the Consolidated budget on its site and also the share of oil & gas of the Consolidated budget is reported in the statistics, but still omitted in public discourse. That amounts to self-inflicted bad PR and feeds into the anti-Russian narrative, as the oil & gas share in the stand-alone Federal budget obviously is much bigger. Hereby it is noteworthy that the Russian regions (excluding the Federal Budget) managed to balance their budgets, cutting in 2016 their total budget deficit from the previous year’s 170 billion rubles to only 12 billion rubles. Oil & gas related revenue made up only 17% of the total Consolidated budget revenue in 2016. (The misinformed method of relating the share of oil & gas to the Federal budget would yield 36% for 2016, this is why it is so important to get the fundamentals right). The above chart shows the division of consolidated budget revenue per source. Social taxes (properly called social contributions) stood for the biggest single revenue source at 22.5%. The other payroll related tax, Personal Income tax counted 16.8% and VAT 16.2%. Thus we have three sources of budget revenue which equal approximately the same share as the oil & gas related revenue. In the three years of sanctions, Russia’s government debt has edged up only slightly remaining the lowest in the world among major countries. Russia’s government debt at 13.2% compares very favorably with Western countries, where Japan has a rate of approximately 200%, Italy 132%, USA 107%, and almost all countries of the Eurozone show debt at levels of 60 to 80% of GDP. The public debt stood at 11.1 trillion rubles as of 2016. By today’s exchange rate it equals approximately $190 billion. It was 13.2% of the nominal GDP, but it is useful also to compare it with the real PPP adjusted GDP. Russia’s PPP adjusted GDP was about 3 times higher than the nominal GDP, therefore the government debt to PPP GDP was in the range of 5%. This is a sensible way to assess the debt level because the PPP GDP shows the real size of the economy and it predicts the growth of the nominal GDP, while the debt value is constant (save currency exchange fluctuations). (External debt comprises all the debt that both the public and private sectors own to lenders abroad: government, banks, corporations). We have wanted to put these debt figures in perspective by showing which part of the debt is owned by corporations. Additionally the part of the corporate debt that is owned to affiliated lenders has been shown separately. Such affiliated lenders the parent companies (or other group companies) of Russian subsidiaries. A big part of them are at the end of the analysis Russian owners who have structured their holdings or financing through foreign countries. Due to its character, the affiliated debt would have to be excluded from a macroeconomic debt-risk analysis. It should also be noted that in addition to foreign debt, all the Russian national economy actors (government, banks, corporations) also have foreign assets. In fact, Russian public and private entities have more foreign assets than liabilities. We countered with an article in the Russia Insider (December 20, 2014) where we punctured Krugman’s puerile and unprofessional argumentation. Krugman had devised an elaborate upside down theory that claimed that Russia’s debt should be examined in relation, not of its nominal GDP, but the PPP adjusted GDP. A good idea as such, but the problem is that that kind of logic should for sure yield the totally opposite conclusion: In relation to the PPP GDP (which is far greater than the nominal GDP), the debt which always carries a nominal value would of course diminish in comparison, which is exactly what happened. We also pointed out to the good doctor Krugman, that a very large portion of Russia’s external debt was that of Russian corporations towards their offshore essentially Russian owners, and correspondingly a large portion was debt by Western subsidiary corporations towards their foreign parent companies. Further, we educated Krugman in the legal facts of debt and the possibility of corporations to default without the sovereign defaulting. We concluded, by suggesting that Dr. Krugman should calm down and not fear any Russian debt melt down. Events have proven us right. Another so-called economist who also joined the chorus of the debt problem hysterics was the Swedish Anders Aslund (we were tempted to commit the usual typing error whenever his name crops up, to add a second –s in his family name). Mr. Aslund is not an economist, he is a propagandist who has – ever since he was kicked out of Russia in the wake of the catastrophic shock therapy policies of the 90s, of which he was one of the architects – devoted his life to fabricate economic analysis at US think tanks with the single minded task to vilify Russia. At the time we were also compelled to take Aslund to task for his nonsense in another article in the Russia Insider (December 22, 2014). By a series of blunders – actual or deliberate (you never know with these guys, the expertise is very shallow indeed) – Aslund tried to prove that Russia’s currency reserves are only half of the actual reported $400 billion. The case he built was based on 100% flawed reasoning evidencing that he had no understanding whatsoever of the basic accounting facts involved. (For the intricacies on Aslund’s confounded reasoning, please, refer back to our above referenced article). In fact, it seems that Aslund had planted a hint revealing what he was up to by qualifying his logic by admitting that the result “was depending on who’s doing the calculations.” Well, we know who, for whom and why. Next, after having thus devalued in his mind Russia’s foreign exchange and gold reserves, Aslund went from ridiculous to preposterous when he followed up this failed argument with the absurd claim that his imaginary merely $200 billion reserves would be eaten up in the following two years. This idea was born from his convoluted reasoning which essentially boiled down to claiming that the Russian national economy from then on would stop earning anything, being placed into receivership, and doing nothing but paying off two-years of debt with its last money. And then close up shop. We see now that it did not go quite as Aslund had imagined it. And as it was shown, more competent economists told him so. 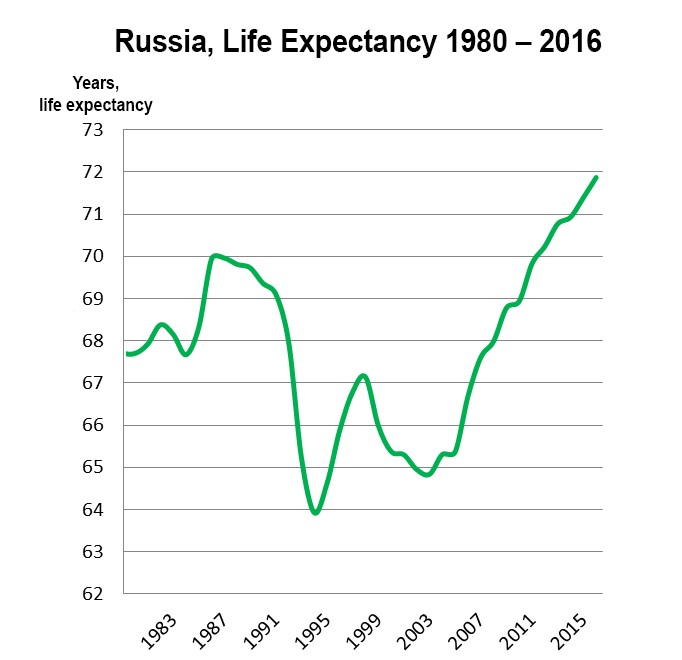 This is best gleaned from the growth in the life expectancy of Russians which in 2016 reached the all-time high of 72 years (up from 67 when Putin first became president). In these years natural population growth stabilized demonstrating a slight increase first time since the fatal year of 1991 (Chart 28). This together with immigration into Russia, pushed the number of population to a new record high of 146.8 million (within present borders). The most spectacular change occurred in statistics on homicide and suicide. Putin having reined in criminality since becoming president in 2000, homicide rates are down by a staggering 80%. Even during the years of economic defense since 2013, the downwards trend continued with a more than 20% drop. 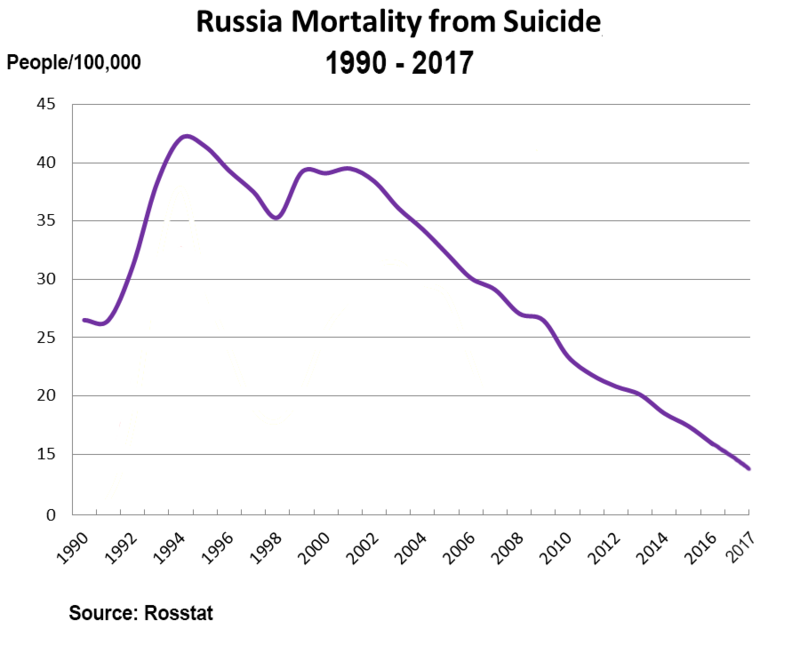 Manifest improvements in social security and the optimism that has taken root in the Putin era have seen suicides going down by 60% since 2000 also with a 20% decrease since 2013. That life has become better and living happier under the Putin era – and so notwithstanding the sacrifices demanded by the economic defense – is also confirmed by polls. The Russian Public Opinion Research Center (VTsIOM) has found according to a report released in April 2017 that the percentage of Russians that consider themselves happy has hit an all-time high since research began in 1990. The level of happiness in Russia, as reported by the public, had reached 85 percent. Before Putin Russia’s demographic prospects were very dire indeed. Foreign analysts gleefully predicted that by year 2030 there would be only 125 million Russians left. But as with so many other of the fundamentals in the Putin era, there occurred a remarkable turnaround, and instead of a predicted remarkable decline, the population number stabilized. 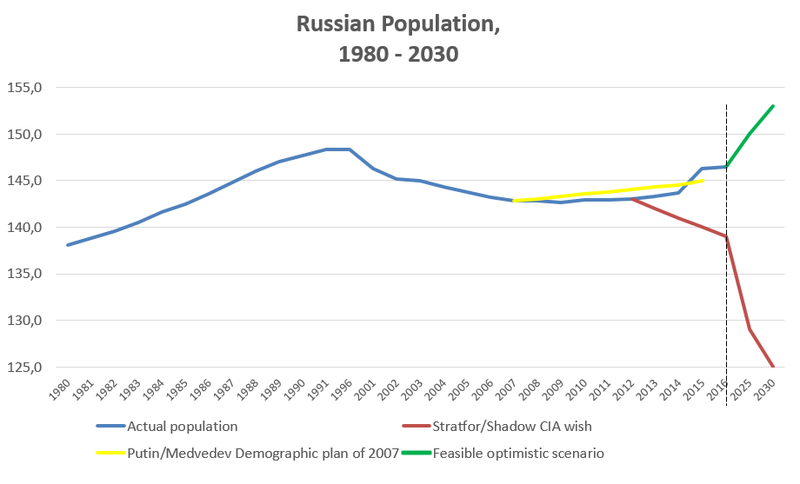 The blue line shows the actual population growth and the yellow line is that foreseen by the Putin/Medvedev demographic plan of 2007. The aim was to maintain the population with a slight growth to 145 million by 2015. This feat was achieved against all odds. The red line shows, the doomsday scenario “predicted” by Stratfor, aka the Shadow CIA. The green line illustrates the Government’s optimistic scenario of reaching 153 million people by 2030. In actual fact Russia’s population stood at 146.8 million as of 2016. The plan of 2007 was thus overfullfilled, largely thanks to the eagerness of some 2.5 million Crimeans to become Russian citizens, which was achieved in 2014 through their referendum about reunification with Mother Russia. We hope that by 2030 (actually much earlier), Russia would get another population boost from the reunification of Donetsk and Lugansk with Russia. 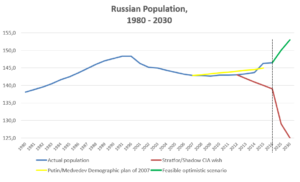 We are grateful for the insight to Anatoly Karlin from whom we adopted this graph and other insights into Russian demographics. Thanks to the improved economic and social conditions in the country and Putin’s demographic program, Russia managed to reverse the catastrophic demographic trend inherited from the liberal anarchy of 1990s. There has been a marked decline in deaths and a corresponding increase in births, as a result of which the natural population growth stabilized. However, at the end of 2016 and markedly in the beginning of 2017, the number of births has suffered a marked decline (per May, down11% year-on-year). The fundamental reason for this can be found in the demographic crisis caused by Gorbachev’s Perestroika and the anarchy of 1990s. Due to the ensuing chaos and economic and social crisis the number more than halved from the levels of the 1980s. In the years between 1983 and 1988 about 2.4 million babies were born each year, but in 1989 births dropped to below 2 million. This was followed by a further steady decline to reach a low of 1.2 million in 1999. As a result of the low number of births of those years, the number of people reaching adulthood started to sharply decline after 2005. That year saw 2.5 million new young adults. But by 2013 the number was down to 1.2 million. Only in the mid-2020s will the situation improve back to 1.5 million, reaching the level of 1.8 million by 2030. What this means is that there simply is a diminishing number of women in a child bearing age. This has, though, been, and will continue to be partially compensated by the increase in fertility (the number of children that one woman has). We refer back to Anatoly Karlin’s above cited report for this. This means that whereas in the year 2005 roughly 2.5 million people reached adulthood (age 18) the figure was halved by 2013, with only 1.2 million reaching this age. The figure will see only slight increases until at least 2020, after which it may approach 1.5 million, still much lower than the number of young adults of the mid 2000s. 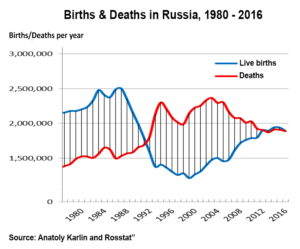 While we do acknowledge that the gaping demographic hole created by the chaos of the 1990s must serve as a fundamental reason for the present renewed decline in births, we are also inclined to point a finger at the Russian Central Bank, which has acerbated the situation with its sever austerity policies (their overzealous fight against inflation). 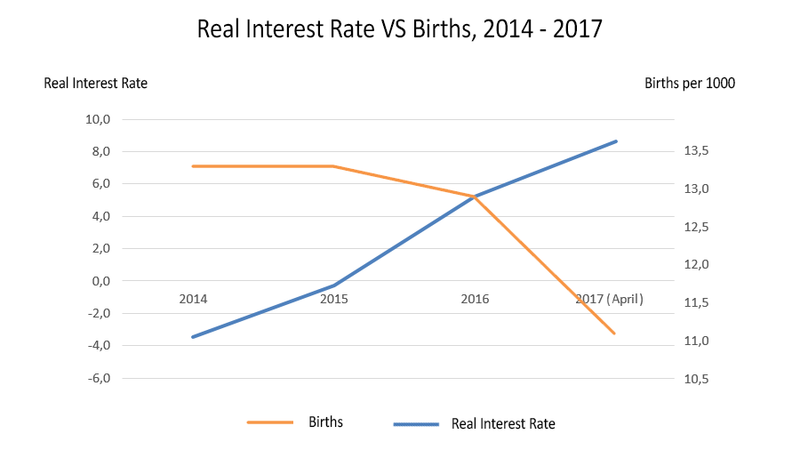 Above we have already presented a graph which shows the pernicious correlation between an excessive real interest rate and births. This literally squeezes people financially and leads them to put off any plans for family increase. Number of homicides and suicides have continued to fall with amazing speed. 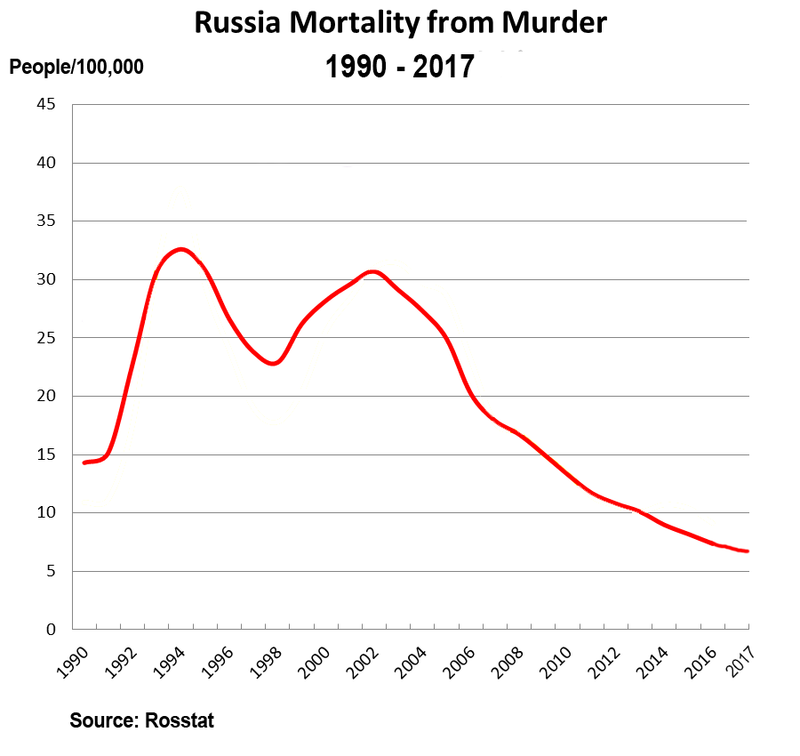 Homicide rates are down by a staggering 80% since Putin first became president in 2000. Even during the years of economic defense since 2013, the downwards trend continued with a more than 20% drop. Manifest improvements in social security and the optimism that has taken root in the Putin era have seen suicides going down by 60% since 2000 also with a 20% decrease since 2013. 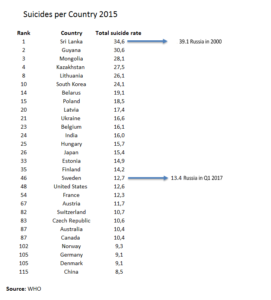 In an international comparison, Russia’s suicide rates have undergone a remarkable improvement. Below chart contains the data of selected countries in terms of suicide rate. It shows their global ranking and number of suicides per 100,000 people in year 2015. (This is a sample of countries, their rank in the total list is shown in the right column). Against this data, we show which were the number of suicides in Russia in 2000 and Q1 2017, and where they would rank in this comparison. The chart shows that their has been an amazingly rapid decrease from the absolute hellish top down to the level of Sweden and the United States. According to one of the several prejudiced Western stereotypes about Russia, they have an eternal problem with alcohol abuse. 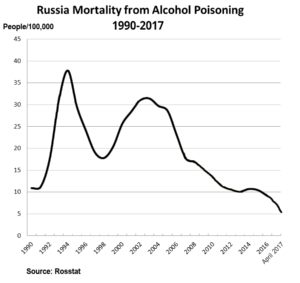 As one press heading went “Russia is quite literally drinking itself to death.” But enter Putin, and even this supposed eternal problem has started to fade away. 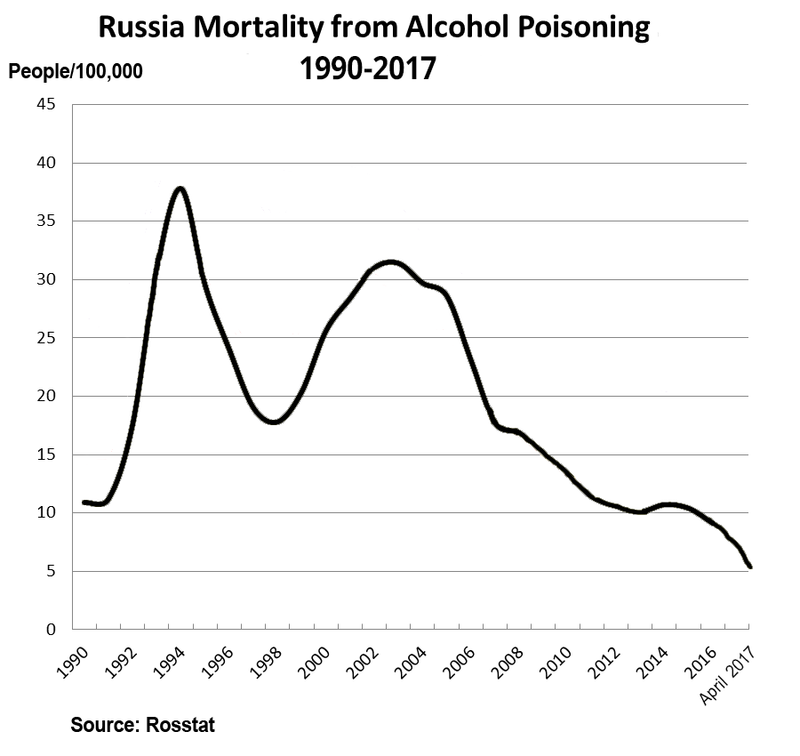 There were more than 30/100,000 cases of death related to alcohol poisoning at the start of the Putin era, but now it is down to 5.2. The above referenced statistics about homicide and suicide, correlate with that of alcohol poisoning, as Anatoly Karlin has pointed out, and are to some extent directly related. Another remarkable achievement of Putin’s demographic heeling program has been the rapid decrease in infant mortality. 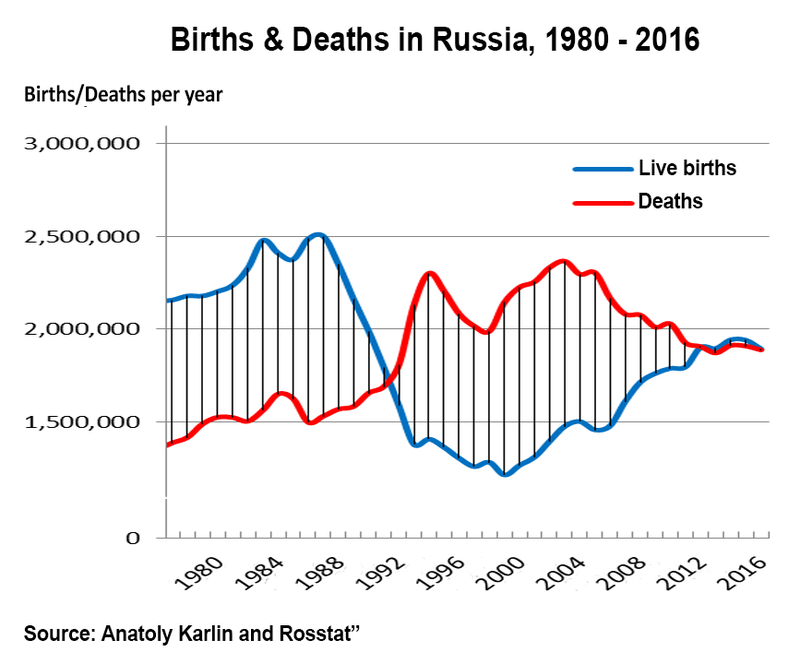 For levels of 17 deaths per 1000 births prevailing under the era of liberal anarchy in the 1990s, Putin has managed to push it down to 5.2/1000 (Q1 2017), which is also a startling all-time record low for Russia. In an international comparison that would now rank Russia on par with Canada, 34th among all world’s nations. Thank you for this impressive article that explains the Russian view of economic data. Maybe they are “adjusted” like in any other country (such as “hedonistic corrections” in the US GDP) but I think the trend is correct. Let me add my experience. In practice (as in my business in road construction) there are no sanctions. Surely there are a lot of restricted this or thats on some lists, but nobody controls RU exports seriously. Looks for me that the media has to obey their US masters, but the government (which is different thing then the more as US agents acting politicians) knows very well that something in the US tries to cut EU business to RU without any compensation. Just to keep everybody weak except themselves. This is btw. and imho the biggest drawback of US influence in the world, the lost of trust. Or as we say over here “Hochmut kommt vor dem Fall”. This sounds really cool: ” Russia now has the world’s most self-sufficient and diversified economy capable of producing anything possibly made in the world”. Are you kidding? This is merely wishful thinking of patriotic accountants (Russians from Awara). USSR tried to be self sufficient and then passed away. Russia today is not self sufficient and is not capable to design and produce anything more or less technologically advanced and in visible quantities. Military toys are in exception as they all are made by western machinery (bought legally before sanction or stolen after sanctions). Therefore, my dear accountants, take it easy and be happy. I am sure that most of you drive foreign made cars (inomarka in Riussian) and fly Boeings or AirBuses…. It is not bad to have domestically supplied food – but open your eyes and see that this food was produced using imported technologies, chemicals, seeds and machinery. Even Russian made agricultural machines are equipped with Germans engines. Putin pushes for self sufficiency of Russia. Great! Then he will isolate Russia from the world (except pumping oil and gas there) and we will see re-creation of USSR. If I hate Russia I should support Putin’s ruling as long as I can. Why? Because it is hard to find somebody else dragging such great country to the past, back to the USSR grave. Putin is a hope for the West for keeping Russia self sufficient and isolated. Зато Крым ваш!. You either didn’t read the article very well or you are incapable of suspending the anti-Russia diatribes that are so prevalent in our privately-owned corporate-controlled MSM echo chambers… either way, you’re a great example of the insular, close-minded mindset that is so dominant in our ‘”exceptional” Western world. Is it place for comments or place for silence? If you want to hear only yourself and alike – then please accept my condolences. 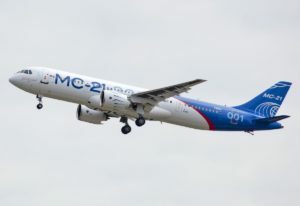 “MC-21 airplane, which should compete with Boeing and airbus-320neo” – the key word is “should”. It sounds very familiar. Should doesn’t mean you actually can. Having western engines (russian engine is not ready yet) and avionics and western equipment for manufacturing other parts it is possible to have MC-21 in 2-3 years as a decent airplane. The problem consists in the fact that by that time Boeing and Airbus will move forward and your MC -21 will look obsolete. And, let be honest to yourself, MC-21 will never succeed on international market. I even do not believe that MC-21 will be capable to push out western airplanes from Russian market without Russian government protectionism. Look at SuperJet as an example. It is highly probable that MC-21 will have the same destiny. What is my point – it was a great deal of stupidity to grab Crimea and start failed Novorossia project at the time when Russia needs western technology most. Instead you got from your lovely western partners decisive western sanctions. Then – enjoy. 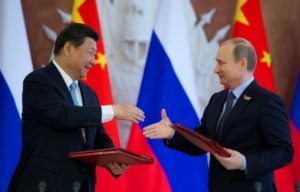 On one hand, I have no doubt this and a number of recent articles on russian prosperity are sprinkled with glamour, wishful thinking, and exaggeration, bu that is common in all publications, and like china’s crazy statistics on their prosperity and growth should be taken with cautious optimism. Saying that, what do you expect? For russia to just give up and die, for all russian people to just stop existing and instead join the imaginary world of western economics (which is true, US prints its own money). There is far greater history and national pride in slovak ex-soviet nations and europe than there is in the americas (leaders of the west). Self sufficiency is not possible in the reality of things. You cannot do everything yourself, hence the rapid growth of modern global technological efforts. But in the face of strong opposition by the west in terms of sanctions there isnt much choice. Information can be imported or it can be discovered in house, either way in the end there will be a way to get the tech, and services into reality. But what russia does internally is staggering in comparison to what all other nations are capable of. To a point that if is completely isolated like NK it will continue to fare well. Here is why western propaganda and anti russia narrative fails completely. Russian education system is very good. In fact in comparison to any other nation, soviet nation single handedly took ont he combined efforts of US and allies and in some areas outshined the technological feats of the others in the world. This is why US is afraid of russia, alone it can sustain itself and push forward. The notion that soviet russia was somehow worse of, is a misconception of many decades of indoctrination and propaganda by the west post cold war. There are a huge number of factors to everything, and collapse of soviet union is no exception. US believs it won the war, allies of eu believe they won the war, but lets not forget USSR single handedly fought on many of its own fronts and also pushed Nazis to berlin. Same with economics, west believs its system is best, so does china, so does russia. In reality we are all just monkeys with tools on a rock hurtling through space around a sun. and speakcing of efforts of single soverign nation, and its technological feats. Sure the car industry is mostly imported, but so what. The tech is there, its not like russia lagged behind tech in all aspects always. During ww2 russian tanks were the answer to the nazis, in cold war russia had the rocket tech for ICBMs to this date the piccinle of roecket tech, to a point where US was still using russian rocket engiens to launch rockets into space. Point being together humanity can achieve everything, alone like North Korea its not very easy. But russia isnt lone it isnt a communist nation. It is by far worlds largest self sustaining economy, and its reliance on self sufficiency is largely due to western pressure. There are companies and corporations who do, and want to do business and exchange technologies with russia. But are not allowed to by the US, just like NK these do hurt. Reality of things are not what propoganda leads us to believe. I don’t understand what in the Awara’s essay irritates you so much. Why can’t you understand a difference between “Capable of producing anything” and “already produce everything”? Our country can produce most of required but we are still using different ways to import what we needed. What “technologically advanced” things do you mean Russia can’t produce? Software? Google had been founded by ex-ussr citizen. We have some world-wide known companies like Kaspersky for example. The company where I am working now was #1 in Gartner MQ in 2015. We can drive foreign-designed cars (but most of them are produced on Russian territory with different level of localization). Or we can buy some locally designed car. http://www.lada.ru/en/ – this is passenger car producer. Yep it uses some foreign parts but nothing critical. Most of significant parts are designed locally and can be manufactured locally (if not already). https://www.uaz.ru/en/ – this is for SUV. Here is agricultural machinery producer. You can say that it uses german or american engines. Yes it is true. Why not use the best-in-class products while they are available? But if you look carefully you also can find versions with russian engines. We use it and we will start to produce more such engines if US of Germany stop to sell us the engines. We already have the replacement. An it is the main idea of the article that we are commenting. You wrote about imported technologies for agriculture? It is nonsence because our country has most inclement climat in the world. We don’t have such technologies that can work here. Those words about Putin’s desire to isolate Russia from world is wrong at all. It it the West who always has been trying to isolate Russia. To build “iron curtain” on our borders. There is nothing new for us in Obamas speech about isolating Russia. What have changed since famous Churchill “Sinews of Peace”? Oops, there is no soviet union, there is no Warsaw Pact. Most of countries that formely took part in it now are in NATO. We have weekened our communists, we are now a common country with parliament and elected president. But it still is not enough. While our president always mention western countries as “our western partners” they treat him as the devil incarnation and our country as the most dangerous threat on the planet. Guys we are not stupid. We remember that wars always came here from the west. We all know that you would like us only in one case – if we are dead. Are you all as ready to die trying to conquere Russia as we are protecting our motherland? And the last words about Crimea. Ukrs was planning to exile Russian fleet from Sevastopol. And they was told that it would not happen. They didn’t believe that we are serious. They tried and now get the results. Sanctions didn’t fail. They weren’t targeted at Russia in the first place. They were targeted at individuals. They weren’t targeted at Russia???? Are you managing to keep a straight face as you type this? Exceptional article in many ways. It seems that even the most optimistic official predictions (2% growth this year) were too conservative, no? 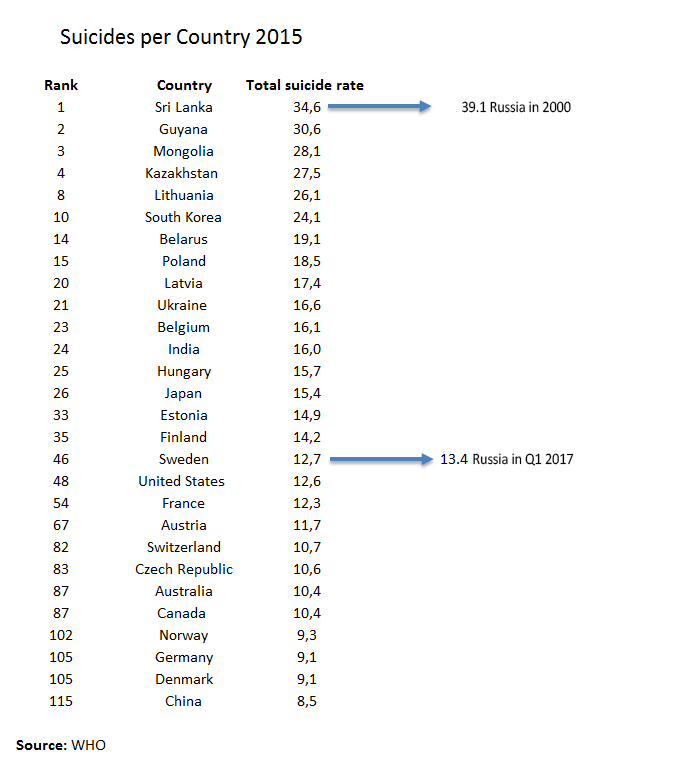 Wait, so the Russian suicide rate is now lower than Finland’s? Or in any case, roughly similar? Wow, that is insane. That in itself destroys so many myths and stereotypes about Russia. I read Anatoly Karlin’s blog regularly, so I was very aware of the demographic normalization, but I didn’t know that suicides have declined by that much. Prioritizing the federal budget is really bad PR, and Russia must stop it as soon as possible (the Western media is obviously not going to change its tune, no matter what). I have a question… Do you know whether the recent statistics have already been readjusted just like they eventually did with the 2015 and 2016 GDP figures? Because those numbers were improved by quite a bit. They went from something like (negative growth, obviously) 1.3% (2015) and 3.7% (2016) to 0.2% and 2.8%, respectively, but it seems that was not that widely reported. And all that happened as late as in spring 2017, if I remember correctly. Considering that in May GDP was up 3.1%, it seems that the adjustments have already been included from the get go, but I’m not sure. @000434343, Thanks for your insightful comments. As to your question. The data we have comes from the official statistics, so in there they have been readjusted. But, the recent statistics are not yet widely referenced in the media and analytical reports, the way we have done it.